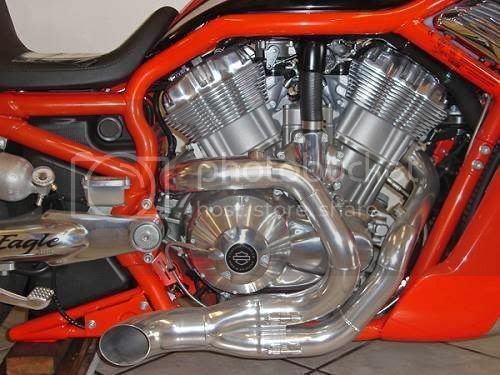 Just curious how much interest there would be in a new 06 Destroyer SE V rod on here. I have the opportunity to get one via a trade deal and if so I may resell it. I would want to get $25,000 for the bike. Its brand new and never ran. MSRP is $31,500 from the factory. If I can find a buyer I will make the deal on my end. P.M. me for more info. Hey hd is that bike setting at a dealer in Kansas City. Looked on your profile and you didnt have a home location pinned. Was talking to our dealer and he pulled his from the floor. He said that they where a one year deal. You would think if that was the case you would be able get $25,000 for it. Freedom Gear drive cams, Elite D Exhaust. Probably but I wouldnt want to get stuck with it. They want me to trade my 02 SE Road King for it. I would just turn around and sell it if I did trade. Not sure if it would be worth the hassle of the trade and resell. I live in Colorado not Kansas bike is in Texas.